Home - Knowledge Base - Does Nutrisystem Work? In the 45 years it has been around, Nutrisystem has helped millions of people who used to struggle with excess weight, including celebrities such as Marie Osmond and Melissa Joan Hart. Its website is filled with success stories meant to inspire people who want to lose weight while also improving their health, raising their energy levels, and learning how to stay fit and keep the extra pounds off for good. If you are wondering whether Nutrisystem meal delivery service can actually help you achieve your weight goals, this post may help you understand what makes it superior to the majority of other weight loss options. Nutrisystem’s approach to weight loss is based on nutritional science and incorporates 3 major rules of healthy weight loss – balanced nutrition, portion control, and frequent meals. By providing optimally balanced meals, Nutrisystem ensures that your body is getting all the macronutrients in the right amounts. This allows your body to function properly and gives you the energy and strength you need. With portion control, you get to enjoy delicious meals that contain just enough calories to keep you satiated. The portions may be smaller than the ones you are used to, but that is where frequent meals come in. By encouraging you to eat up to 6 times a day, Nutrisystem allows you to feel full all day long and forget about constant cravings. You get to eat reasonably portioned meals and snacks every 2 or 3 hours, so you never have to feel hungry. These 3 rules ensure steady and gradual weight loss that does not push your body into starvation mode. Unlike with strict diets that make your body slow your metabolism down in order to preserve energy, which minimizes your weight loss results, with Nutrisystem, you get to eat properly and improve your health while shedding pounds. Clinically proven is a term that is used loosely in the marketing world and its meaning may often seem rather vague. 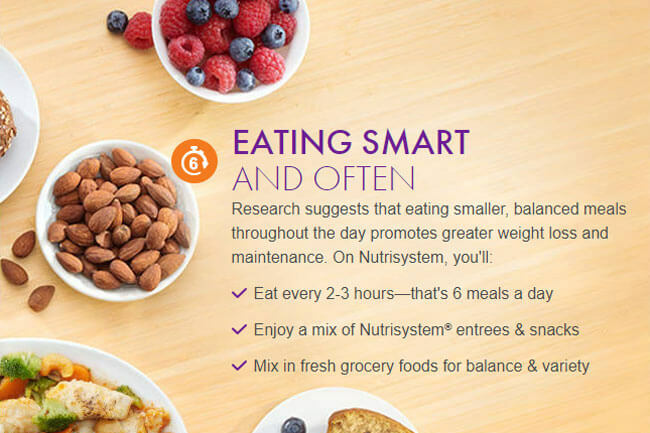 With Nutrisystem, the meaning of clinically proven is perfectly straightforward. Real clinical trials have been meticulously conducted in order to determine Nutrisystem’s effectiveness. Several studies on Nutrisystem have shown that on this program, dieters lose 8.3 pounds and 4.2 inches on average and experience significant health benefits. Nutrisystem has been shown to improve arterial function in obese, postmenopausal women and dieters suffering from diabetes can expect a meaningful change in both weight and A1C. As much as 57.6% of diabetics who participated in a relevant study experienced an overall weight reduction of more than 5% and 52.9% of the participants experienced an A1C change greater than 0.5%. Furthermore, significantly lower blood glucose levels and smaller glycemic variability were recorded. Thus, according to clinical research, Nutrisystem can help you lose weight and improve your health and well-being as well. In contrast to many other programs that apply the one-size-fits-all concept, Nutrisystem provides different plans for men and women and takes into consideration the varying dietary needs of its clients. It provides healthy weight loss options to omnivores, vegetarians, and diabetics. Furthermore, it offers flexible plans that allow you to choose your meals, opt for fresh and/or frozen dishes, and create a plan that suits your lifestyle. If you cannot decide which Nutrisystem plan is the right fit for you, you can opt for the company’s free diet analysis and get a perfect recommendation based on your individual needs. With Nutrisystem, you can expect to lose at least 1-2 pounds every week. Like we said previously, the average weight loss result is 8.3 pounds and 4.2 inches in a month. However, if you stick to the plan and combine it with some healthy exercises, you can lose up to 13 pounds and 8 inches during the first 4 weeks, which is quite impressive. If you find mere numbers insufficiently convincing, you can always check out the amazing success stories of other Nutrisystem dieters. It is important to note that this service provides more than just meals and snacks that can help you transform your diet and shed a couple of pounds every week. It provides unlimited support from counselors and dietitians and helps you stay on track with tools and trackers that allow you to monitor your progress and stay motivated. Instead of promising quick, magical results, Nutrisystem encourages you to lose weight gradually and thus optimize both your weight loss results and your health. While it is possible to shed pounds just by sticking to your meal plan, Nutrisystem advises you to complement your new, healthy diet with moderate physical activity and teaches you how to eat properly even when you are not enjoying Nutrisystem meals. With expert advice on how to dine out responsibly and easy recipes for delicious dishes that promote weight loss, you can learn how to take care of your diet on your own and avoid going back to bad eating habits. Your journey with Nutrisystem does not end once you reach your goal weight. This service understands that losing weight is just one part of the process and that you may need some assistance during the transition and maintenance periods, so you do not gain back the pounds you worked so hard to shed. In order to help you stay in good shape permanently, the service offers excellent transition and maintenance plans and a la carte ordering options that prevent the yo-yo effect and make it easier for you to stay on the right path. We can conclude that Nutrisystem is one of the rare services of its kind that are health-centered, science-inspired, provide excellent support throughout the weight-loss process, and facilitate transition and maintenance. It does not make empty promises but instead provides every individual client with custom-tailored services in order to maximize results, improve health, and support the development of good habits. It is worth noting that if you are not satisfied with the results in the first two weeks, you can get a full refund, which further proves that Nutrisystem is not just after your money but is dedicated to helping you become your fitter, healthier self.